Thyristor Operated Control Panels manufactured by us are more efficient. These are used at regulated heat required places. 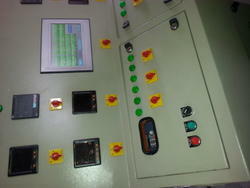 We manufacture control panels for all kinds of furnaces. Our thyristor control panel has three power controllers to operate them. Thyristor operated control panel includes Thyristor Operated Control panel. Our organization manufactures a variety of Thyristor Operated Control Panel having superior quality. These products have three controllers which are generally used for controlling the voltage. Our products are cost effective for fast systems and having high speed for working. Thyristor operated control panels are used as heating elements. Looking for Thyristor Operated Control Panel ?